For the past three or four years I've been designing the invitation for the kids' school Casino Night fundraiser. 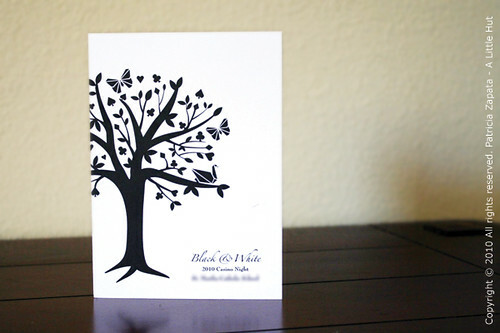 The Black & White theme and white origami cranes that will be used for decorations inspired the invitation illustration. If you'll take a close look you'll notice that I used some hearts, spades, diamonds and clubs as leaves for tree. See them? I'll be working on a large tiered chandelier that I've never attempted before so I hope it goes well. If the project is successful I'll be sure to post a how-to and some photos. Wish me luck!